A utilitarian trade knife used by the Plains Indians in their every-day life. They also used it to skin buffalo and in warfare. It was a favorite among the Indians and Whites alike because it was thin, flexible and lightweight and easy to sharpen. These knives were heavily traded in the Plains. They were used in clubs; multiple blades have been seen inlaid without their handles into war clubs. They were also used as lance points and became the prefect side arm for anyone out to survive on the Plains. Women and men used these knifes to skin and flesh hides, prepare meals, as well as tools for making baskets, clothing and moccasins. They were traded by the thousands. This Plains Indian butcher knife Hand forged from high-carbon steel in the classic shape of the Green River butcher knives of the period. The blade was ground back to simulate over-sharpening through years of hard use. The knife construction is done using a half-tang method, meaning only half of the tang runs into the handle and the rest of the handle is solid. Handle is made from cherry which is a great lightweight hardwood. Blade is held to the handle with two hand hammered copper pins. The original knife had several different sized brass tacks adorning the handle. 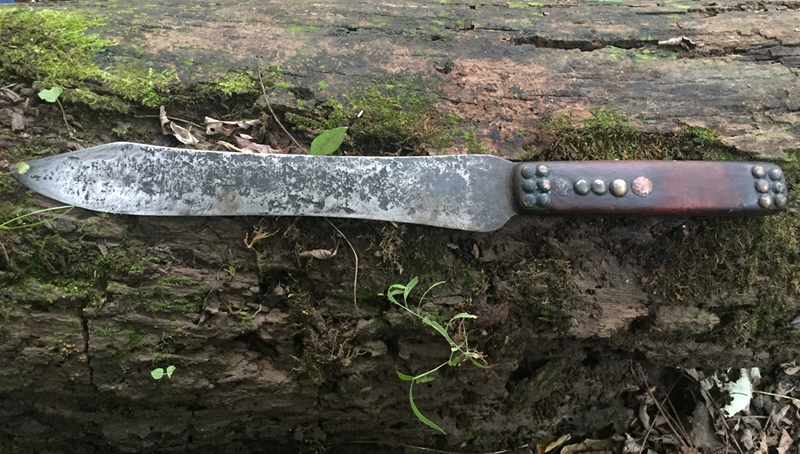 As seen in the photos, this knife had a row of 6 tacks towards the front of the handle on each side and 6 small tacks at the end of the handle on each side as well as 3 larger brass tacks in the center. The cherry handle was stained dark and rubbed back to assimilate hard use and wear. The blade was also aged to include original file marks, light pitting and stain to the metal. These knives were used hard by their owners. Commissioned piece replicated from an original.